Include Spanish Cheeses on your next cheese plate. Two of the best are nutty Manchego from La Mancha or smooth Garrotxa from Catalonia. Most Spanish cheeses are made from goat's milk. That's because the goat makers live in the mountainous regions of spain. Manchego cheese has the same nutty flavor as Jamon Iberico because the goats roam the same ancient oak forest as the pigs where the consume many acorns. Each Spanish region has a unique climate, water and vegetation that produce unique Spanish cheese flavors. You'll love using Spanish cheeses in your salads or including them in your cheese tray. Their unique nutty flavors and rich consistencies ensure that they'll be a hit. This is the perfect way to serve Manchego cheese. Take a huge wedge of it and place it on top of rustic bread. I love arugula and other greens, tomatoes and even sweet carrots. Top with a light drizzle of balsamic vinegar and virgin olive oil. Manchego cheese develops it's flavor as it ages, so it's good to buy a brand that's been aged about a year. 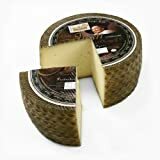 Don Juan Manchego Aged Manchego Cheese is a perfect choice for our cheese board or meal. In addition to eating all those acorns, the goats eat many of the regional herb. This ensures an interesting taste experience. Aging the cheese for a year, gives the interior a firm but certainly not dry consistency. It is not a good melting cheese. It should be used as a wedge with bread or crackers or broken into pieces. You don't have to scour your region looking for a grocery store that carries Spanish Cheese. Click here to buy Manchego cheese from the comfort of your home. Shredded Drunken Goat Cheese is perfect with prosciutto, seasonal greens and balsamicsalad dressing. It's a great way to get the health benefits of cheese and minimizing the amount you eat. Combining cheese with leafy green vegetables always makes them more appetizing. Drunkenn Goat Cheese is a semi soft cheese made from goat's milks, rennet and cheese cultures. Once this semi-soft cheese is formed it's soaked in red wine for two to three days. 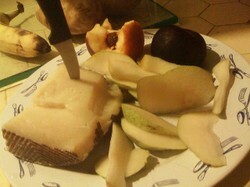 You can see from the picture to the left how the rind becomes purple, while the interior stays creamy white. The inside has a mild and creamy flavor, while the wine provides a sharp finish. This complex taste is the perfect accompaniment to chorizo. Click here to learn more about this cheese or to buy it. Part of the fun of traveling the world, is to taste regional foods. Garrotxa cheese used to be made only in the Garrotxa part of Catalonia in Spain. Now there are cheese makers in other parts of Spain that make it as well. However if you find yourself in this beautiful part of northeast Spain, overlooking the Mediterranean Sea, you might want to try it at its most authentic. Order a cheese plate and enjoy the view! Like many Spanish cheeses it has a nutty flavor. That's because the free-range goats often feast on local nuts. The cheese has a white, creamy-soft interior. While it melts well for hot dishes, it also is great for a cheese platter as well. Click here to learn more about Garrotxa cheese or to purchase it. Clearly, shopping online for these gourmet specialty items is the way to go. I don't know where I'd find Spanish cheese in my area.